Lots of locals were down in Las Vegas for the World Series Circuit stop at Planet Hollywood over the past couple weeks. Several made it through to Day 2 of the Main Event, but nobody quite made it to the money, though some note was taken of their advance. Baptiste Chavailliaz came close to a second Circuit ring in one of the later events. Meanwhile, over at the Venetian, Jaque Lavadour and Angela Jordison were collecting bounties and making final tables in a couple of events. Steve Myers survived several crippling setbacks to take 12th in a $250 buy-in, $150K guarantee event with more than 800 entries. The Big Shot at The Game went off with a bang last weekend, filling all 80 seats, paying a guaranteed $10K to first place, and making a total prize pool of about $23K, according to reports. Outside of the WSOP’s summer schedule, the LAPC at Commerce Casino has to be one of the longer series of the poker year, running from mid-January to early March. In part, that’s because of the LAPC’s plethora of big-guarantee events with low buy-ins necessitating multiple starting days. 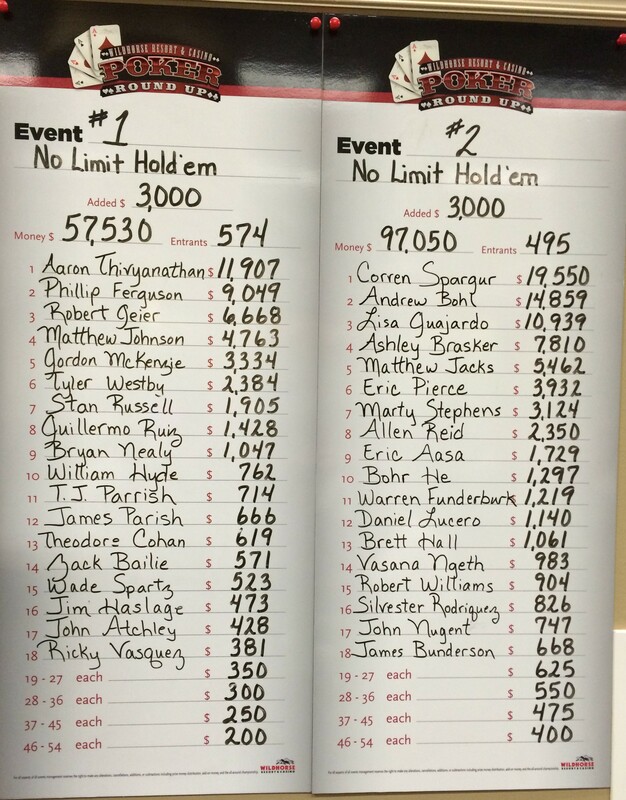 Still, lots of individual events. LA’s just 2.5 hours away by plane, and because of the amount of traffic, if you book ahead you can easily find round-trip flights for less than $200, which makes ground transportation and accommodations the bigger part of the travel equation if you’d going down for smaller-entry-fee tournaments. 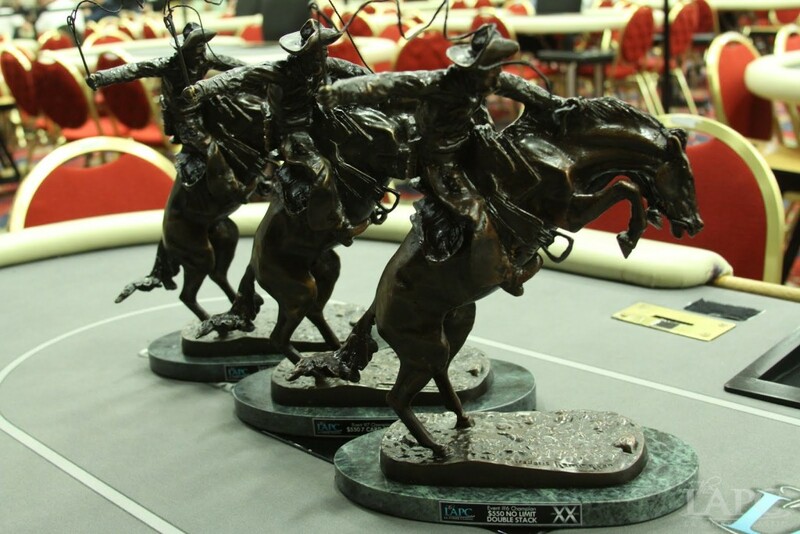 The trophies for LAPC events are distinctive sculptures based on Frederic Remington’s Western work (not what you really think of as “LA” these days, but hey), so if you’re tired of variations on clubs and spades on your shelf, this is the one to win. The big game in town this week is Encore Club’s $35K guarantee, Saturday at 1pm. 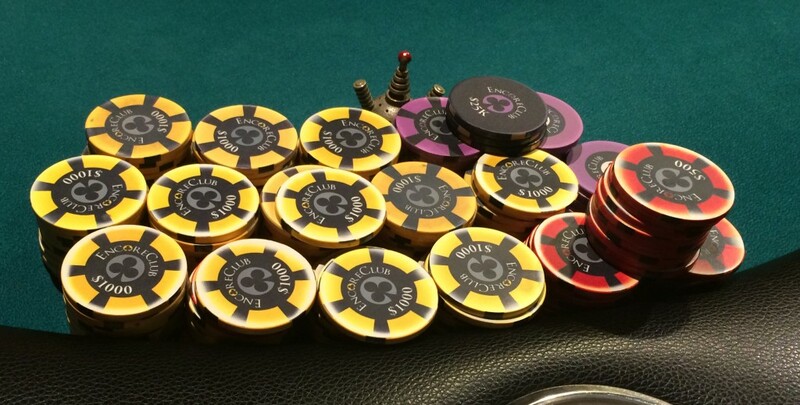 35-minute levels and a 20K starting stack for your $200 buy-in. Re-entry and late registration though the end of the first break (about 3:40pm), but this game will likely have a waitlist, so I wouldn’t plan on late-regging unless you’ve got a backup. 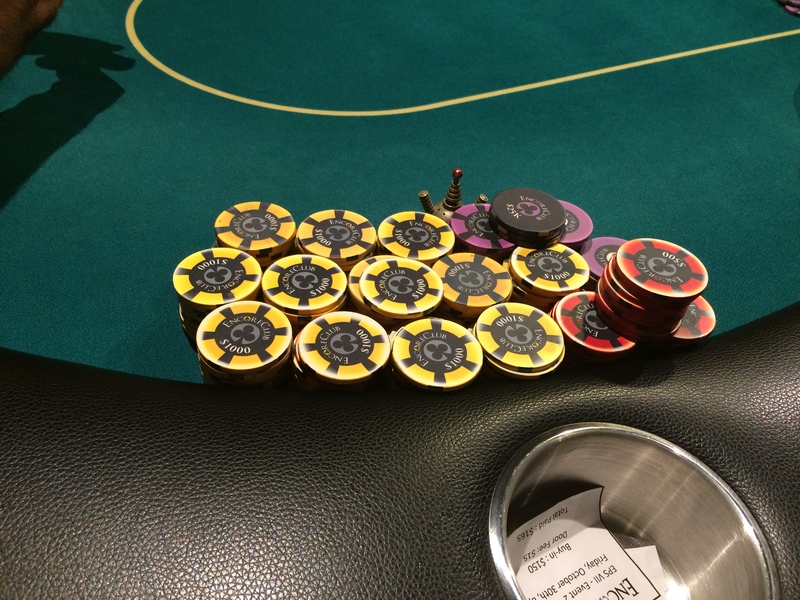 An $80 add-on at the break gets you another 15K in chips. Expect this to be another day with $15 door fees, so bring that extra fiver. Tickets are on sale now. No indication on their home page if Encore will be closed Thanksgiving. 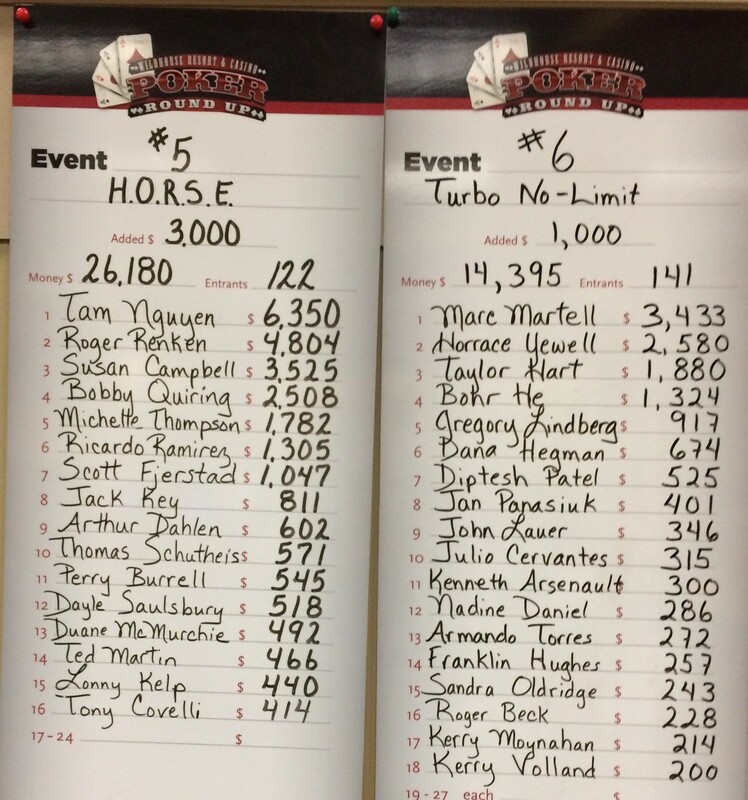 Final Table Poker Club is closed Thursday, but their Thanksgiving will be bracketed by a couple special events. Tonight at 7pm the guarantee is doubled to $3K, with a $40 buy-in, one re-entry, and a $20 add-on. Friday morning at 11am is a triple guarantee ($3K again), for just a $20 buy-in (2 re-buys) and a $20 add-on. Aces Full will be closed Thanksgiving but if you’re hungry, they are offering a $10 food voucher for BC’s bar (below the club) for anyone playing their shootouts (which start at 3pm). They’ve just announced a $5K guarantee at noon on December 5th. 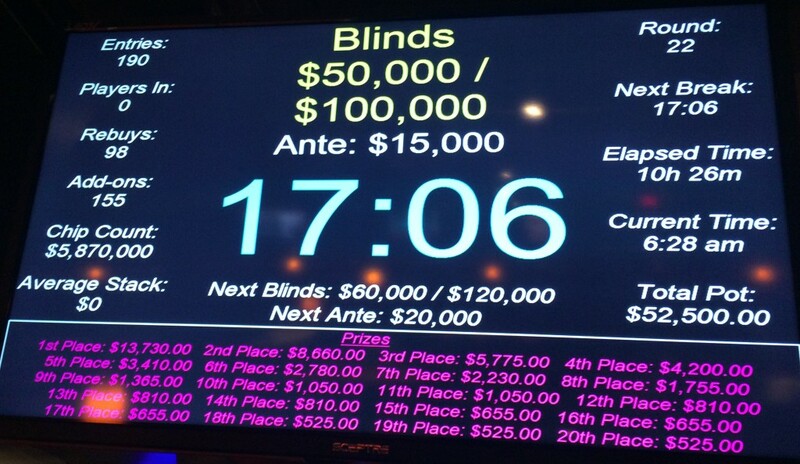 Portland Players Club is closed Thanksgiving, but they’ve got a big $2K Big O tournament coming Saturday at 12:15pm. $100 buy-in for 30K in chips, with 2 re-buys available and a $40 add-on of 20K. Today at 12:15pm is a $500 guarantee freeroll; a $5 door fee gets you enough chips to get in the game, with more available—for a price. At 3:15pm is a $1K guarantee Big O game. Several events in the Ante Up Poker Series event at Thunder Valley have been completed already, but coming up on Saturday is a the $1.1K buy-in Main Event with a $150K guarantee. If you want to brave the Siskiyous to drive down to Sacramento after wolfing down turkey, you could be on the cover of Ante Up magazine in January! Hustler Casino finally woke up their web designers and got Larry Flynt’s Holiday Poker Classic online. There are only two events: a $20K guarantee ($250 buy-in) on December 1, and a $250K guarantee event with eight starting flights over four days ($275 buy-in, November 27-30). The odd twist is that each starting day will send a progressively smaller number of players to Day 2: 11% from the first two flights on Friday the 27th but just 8% from the flights on Monday the 30th. Players from later days will have average stacks larger than the players from earlier days, which would seem to put earlier entries at a disadvantage. Deepstacks Poker Tour has the Championship series for its 2015 season in Calgary at Grey Eagle Resort beginning the weekend after Thanksgiving. The Main Event is a $500K guarantee with a C$2.5K entry fee. November 29th is the Last Sunday of the Month tournament at Tulalip Casino north of Seattle, a $520 (including dealer bonus chips) tournament with approximately 100 players, and $5K added to the prize pool. If you’ve headed down to LA for the Hustler tournament, you can swing (and I use that term guardedly in proximity to the name Larry Flynt) over to the Bicycle Casino, for the next WSOP Circuit stop, beginning a week from tomorrow. The same day the Bike starts up the WSOPC, the WPT is back at Bellagio for the prestigious Five Diamond World Poker Classic. Only one tournament there for less than $1K buy-in, so bring your wallet. Check out the Pacific Northwest Tournament Calendar for more poker. Things are ramping down a bit in the poker world with the November Nine behind us and as the holidays approach. The Poker Mutant once again got shut out of the money in Pendleton, but I’m still looking for the next target. Wasn’t able to get to the WSOPC event at Planet Hollywood, and it doesn’t look like either of the Northern California events are on the schedule, but I’m hopeful about making it to The Bike next month. There’s money waiting for me there! Still no Prague on the horizon, but there’s always next year. California will be heating up in January (see the calendar) with WPTDeepstacks, LAPC, HPT, and Ante Up series, plus some things that likely haven’t been announced. 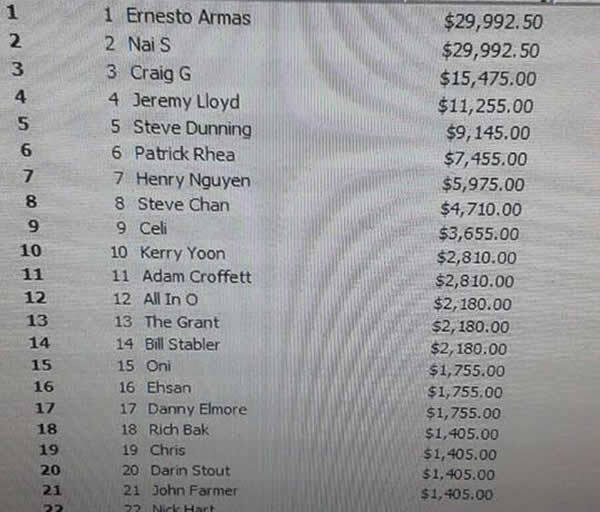 I didn’t stay through the entire Wildhorse series, so I didn’t see this on my own, but congratulations are due to Minh Thy Ledao, a dealer at Final Table, who took first place in a deal at the Main Event over the weekend. 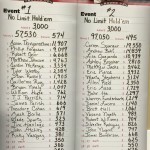 I don’t have all of the payout boards, but here are the ones from Tuesday and Wednesday last week. Coming up in early December is the last West Coast stop for the WSOPC this year, and, as usual, The Bicycle Casino adds a little bit to the standard 12-event WSOPC schedule of events. This time around, an early event is a $150 buy-in tournament with a $100K guarantee. No re-buys. No re-entries. No add-ons. Which means they’re expecting more than 850 entries (with $30 coming off the top in fees) to make the guarantee. 25-minute blinds. 10K in chips (with an extra 2.5K if you pre-register on November 30th between 3pm and 9pm). Probably well over 10M chips will be in play, the game won’t be down to 50BB until the 100K/200K level, and the highest numbers on the structure sheet are 12K/24K, after 24 levels (almost 12 hours, with breaks). So it could be a long day if you’re going to win it. On the other hand, potential for pretty good ROI if you go deep on your $150. Saturday at 4pm is The Big Shot at The Game on Barbur. It’s a $10K guaranteed tournament, with everything going to first place. $100 buy-in and $100 add-on, limited to 80 players, so get your ticket early. Aces Full is offering a $10 food voucher for BC’s bar (below the club) for anyone playing their shootouts (which start at 3pm). Tonight at 7:15 is a $1K guarantee Big O tournament at Portland Players Club. There’s a $2K Big O game there on Friday at the same time. And Saturday is a $1K NLHE Freeroll. Encore Club has announced a $35K guarantee, $200 entry/re-entry ($80 add-on) special tournament for the Saturday after Thanksgiving. Tonight at 8pm is an $8K guarantee. The Venetian Deepstacks Extravaganza IV continues through a week from today. If you’re in Las Vegas today, you can catch the last entry day for their $1.6K entry $500K guarantee; this weekend is a$150K guarantee for $250 entry, and the last big event at the beginning of the week is a $100K guarantee for $400 entry. The LA Poker Open at Commerce Casino runs through Sunday. The $500K guarantee $1,650 entry Main Event has starting days on Friday and Saturday. The WSOP Circuit in Las Vegas continues at Planet Hollywood until Monday. Its Main Event is also this weekend, with a $1.5M guarantee for a $1.65K entry. WPTDeepstacks is running at Redding, California’s Win-River Casino. Friday and Saturday are entry days for the $1.1K Main Event with a $150K guarantee. Lucky Chances Casino in Colma (outside of San Francisco) has their 2015 Gold Rush running through the 23rd, but I didn’t get it on the calendar until this week. Saturday and Sunday are entry days for a tournament with $100K guaranteed to first place, with a $1,080 buyin. Saturday is the opening of the Ante Up Poker Series event at Thunder Valley north of Sacramento. Twelve major tournaments, including a $150K guarantee Main Event with a buyin of $1.1K. According to an ad in CardPlayer magazine, the day after Thanksgiving is the start of Larry Flynt’s Holiday Poker Classic at LA’s Hustler Casino, a $250K guarantee tournament with multiple entry days and a buyin of just $275. It doesn’t appear on the Hustler Casino web site, however. It’s Veterans Day today, take some time to remember the folks you know who are former service members. My own thoughts go to ‘Beaver,’ our neighbor for 25 years, who feeds the cats at Poker Mutant Central when both my wife and I are away. He served in World War II in Europe, enjoys a trip to a casino from time-to-time, and a few years back I took him out to Wildhorse with me (where his jacket got swiped while he was playing slots). Beaver doesn’t much like war films, but when I unknowingly cued up The Monuments Men for post-dinner viewing last Memorial Day, he said they did a good job on the look of the Battle of the Bulge scenes and ended up liking the movie, despite my mistake. If you have the opportunity, go back a few weeks to listen to the PokerNews Podcast episodes from the Run It Up Reno series put together by Jason Somerville. 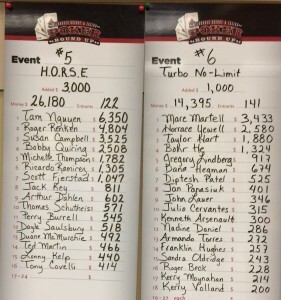 Not a big-money event (the main got 300 runners with about a $500 entry), but the enthusiasm of hosts Donnie Peters and Remko Rinkema for the series and Peppermill Casino venue sure make it sound like a good time. Min-cashed a Bovada $10 buyin Turbo. 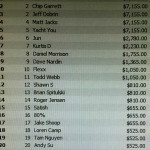 The HORSE tournament’s still playing out as I write this, but here are some payouts for the first four events. Congratulations to the newest World Series of Poker Main Event Champion, Joe McKeehan, and to Whitney Langwell of Eugene, one of the featured dealers on the final table starting rotation! Retreading a Deal from back in early October, two major events in Las Vegas that I know a lot of people are going to already. The DSE has been going since late last month and continues through the last day before Thanksgiving. 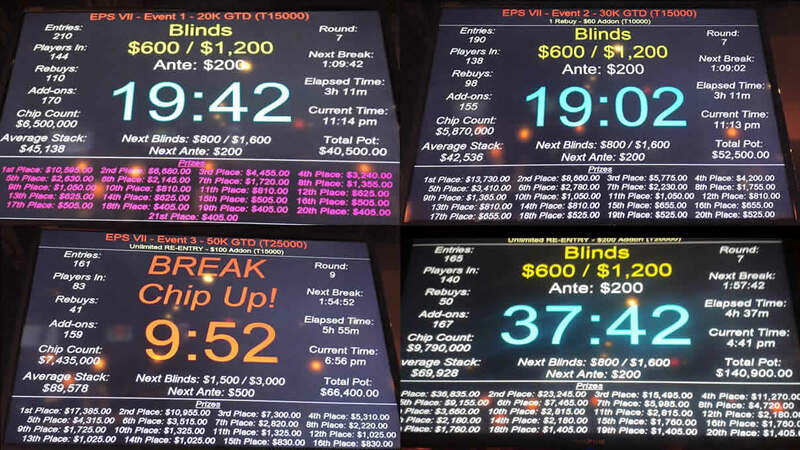 In addition to a lot of smaller events ($10K-$20K guarantees), there are four big multi-entry-day events left: two $150Ks ($250 buyin), a $500K ($1.6K), and a $100K with a $400 buyin. Plus satellites. The WSOP Circuit event in Vegas starts with a $580 buyin $500K guarantee that has entry days with two flights each tomorrow through Saturday. 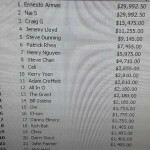 It culminates with a $1.5M guarantee Main Event next weekend, for a $1,675 buyin. I’ve also mentioned the end-to-end series in Northern California through the middle of the month, with an Ante Up Poker tour series at Thunder Valley outside of Sacramento following on the heels of a WPTDeepstacks series at Win-River Casino in Redding. Win-River juiced the pot last week by offering free rooms to players who pre-register for the Main Event. If you’re reading this early Wednesday (and really, you should be, because it gets posted at 7am), you’ve got time to make it to Encore Club for a special Veterans Day $9K version of their noon game. $40 buyin, one live rebuy, and a $20 addon. Portland Players Club has one of their $2K Big O tournaments on Sunday at 12:15. $100 buyin for 30K in chips. The Venetian Deepstacks Extravaganza IV runs until Thanksgiving. See above. 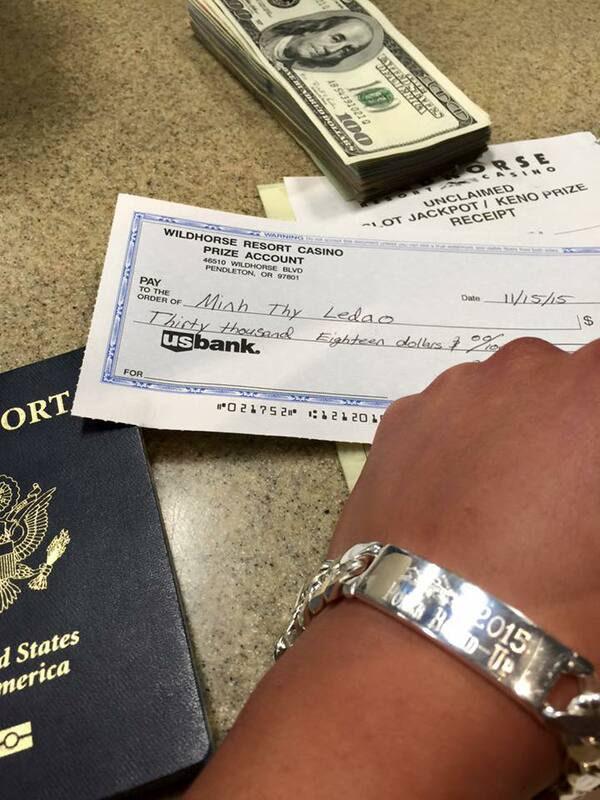 The Mid-States Poker Tour stop at Golden Gates in Colorado has its main event this weekend. The LA Poker Open at Commerce Casino runs through Sunday the 22nd. This weekend has a 1-day PLO event on Saturday and a $570 buyin $150K guarantee with entry Thursday through Saturday. 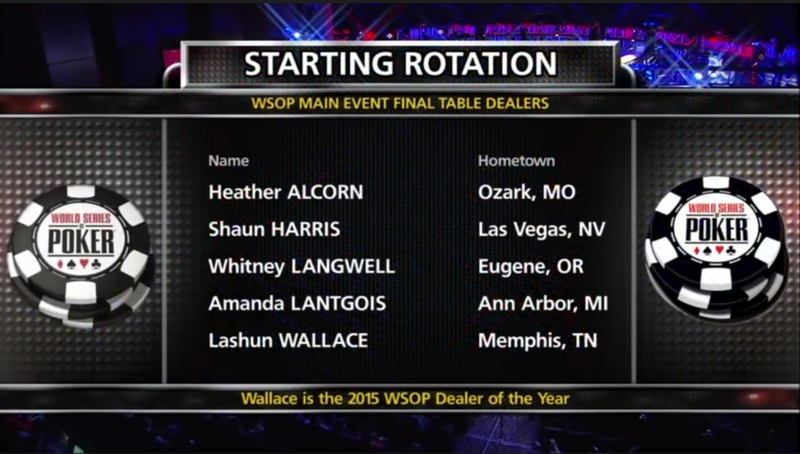 See above for the WSOPC in Las Vegas. WPTDeepstacks opens at Redding, California’s Win-River Casino on Friday. I just missed cashing last night’s Final Table $20K guarantee (I so wanted a consecutive Friday night cash) but this hand, where I shoved 9♥T♥ from the SB over an EP raise with about 8BB was kind of fun. Original raiser had a big stack and AxJx. I flopped a pair with 2♥T♣K♥, then improved to a flush with the J♥ turn that otherwise gave him a better pair. I don’t remember if his ace was A♥, but even that was irrelevant with Q♥ making the absolute nuts. I have to admit, I was feeling a little frisky after cashing Friday night, and when I got home earlier than expected after my father’s birthday lunch earlier than expected, I had a bit of a choice. I could run out to Encore for the $100K and plunk down 10% of my win for the door, entry, and addon as a post-break late-reg, and sit down with 50BB, or I could check in on some of the big games I don’t usually get the chance to play on Sunday afternoon when we’re doing the family dinner thing. As it happened, Bovada is running their Golden Spade Poker Open series, and they’ve bumped the usual $100K guarantee on Sunday up to $250K for a couple of weeks. It was just about to go up from 50/100, and even though that meant I’d quickly be under 50BB with a 5K starting stack, I figured I was saving $550, so I topped up my account and dove in. I called a HJ raise along with CO and folded to a CO bet on the K♦T♠5♣ flop. HJ had A♥Q♠, CO had A♣K♥. UTG1 limps in and I raise to 600. D 3-bets to 1.75K, forcing out the blinds and UTG1.I shove, D calls with A♦Q♦ and this could be a short tournament. The board runs out dangerously close to a wheel before making my full house: 4♣5♥3♦4♠K♣. I raise and take the blinds. I called a raise to 455 from UTG1, we checked the board down to 2♣5♣8♠8♣Q♥ and I fiolded to a bet of 1.1K on the river. He had A♠Q♠. 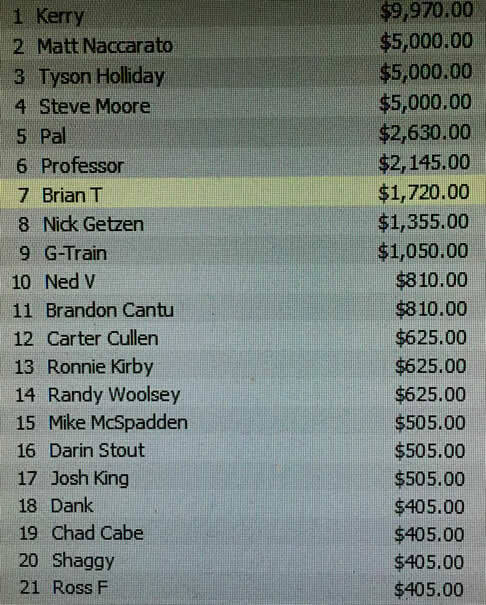 I raised to 600 and took the blinds. Yes, this was a bad defend. UTG min-raised with Q♣K♠ and HJ flatted him with J♠J♥. I called with a hand I slip in from time to time, and BB came along with A♦5♦ . The 4♠7♦7♣ flop put me in pretty good shape, considering, and I called a 600 c-bet from HJ. I should have been scared by the 7♠ turn, but it was the 2.8K bet after the 8♣ river made my straight that I should have been worried about. Why not bleed away some more chips with a low pair? UTG2 raised to 465 and I called, then D shoved 4.9K and UTG2 called. I folded. D had 6♠6♣, UTG2 had A♦K♠ and the first card off the deck was the K♦. I was still in, at least. What is it with 5s? I min-raised, got called by UTG2 and BB, flopped A♣9♠4♣, and folded to a 400 bet from UTG2 with A♦Q♥. I shoved all-in, BB called with 9♦9♠ and 8K behind. caught a K♣ on the flop and doubled up. 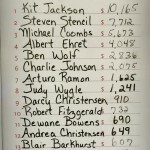 UTG raised 7♥7♦ to 537 and I shoved stack of equal size. He folded. I opened for 750 and everyone folded. CO raised 9♠9♦ to 600, getting a call from 8♣7♦ as D. I shoved, CO called all-in, D folded, and I hit Q♦ on the flop to knock a player out and nearly double up. I raise to 900, HJ calls with K♦A♦. I bet 1.3K on the 9♣T♦A♥ flop, he calls, still ahead. J♠ turn and I’m open-ended, at least; he folds to a 2.6K bet. How lucky is that? Nobody calls my raise of 900. I raise to 1.2K and take blinds and antes. I raise and nobody calls. I raise to 1.2K and get HU with CO, who has Q♠Q♥. The flop is K♥T♣K♦, and I check-fold to his exploratory 1.2K bet. I’ve got the second-largest stack on the table, but even I’m only 35BB deep at the new level. There are three players in the 10BB range, so people are playing a bit cautiously, since setting one of them off can make a big dent. UTG has 11K and just limps in with A♣Q♠. The flop is 5♠9♥2♣. I check my top pair and UTG checks behind. We both check the 8♣ on the turn. I take the 5♦ on the river as a cue and bet 1K, he folds. I open to 1.5K and SB calls with J♣A♥. I have middle pair after a flop of Q♦T♣7♦, but SB bets 3.9K on his gutshot and I fold. Raise and take the blinds. UTG raises to 1.8K with K♠A♦, CO calls with 8♠7♠, and I ride along. The flop is 3♠2♠Q♣ UTG bets his high ace for 2.4K, CO incredibly folds for less than 10% of his stack to what I would have assumed was exactly the flop he was looking for, and I fold because it’s the wrong color black, for the most part. Not exactly a good time to go card-dead for twenty-odd hands. We’re getting near the money, with maybe another 50 spots to go before the bottom rung payout at 297 (15% of the field was paid). When action folded to me, I raised to 2.4K, even though 5s aren’t my favorite hand, and took in a few chips. I folded this, actually. not wanting to get involved in another hand after I’d just made a raise. D opened J♣8♠ and got folds. Maybe I should have played it. UTG2 limped in with K♥Q♣ and 48K. UTG4 (17.5K) raised Q♦Q♥ all-in. I figured I was racing at best and folded. I’m in seat 1 with the second-smallest stack. We’re 30 places from the money. People are busting out relatively quickly, and I might be able to go a couple more orbits to squeak in, but I could be down to 5 big blinds at that point. Four of the stacks at the table have me covered by 3x. I take a chance and shove, HJ has 47K and J♣J♥, and he raises, the board runs out KxK♥9♠3♥J♦ and he makes the full house. Three hours and four minutes. 164 hands. 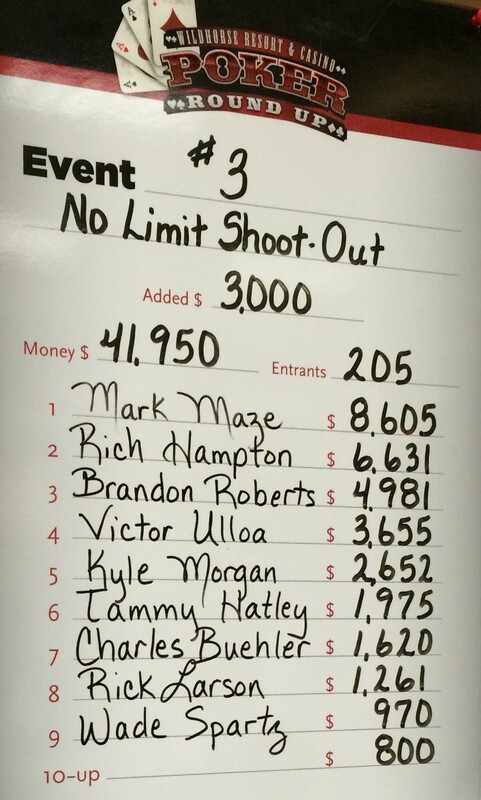 324th place of 1,760 entries. -100% ROI. VPIP: 15%. Went to showdown with 20% of hands played, won 60% of showdowns. They promised $200K in guarantees, but the four events of the Encore Poker Series VII broke just over $300K total, with the first event doubling the guaranteed prize pool. The smallest of the events (in terms of entries) was the $50K on Saturday, which was competing with not only Halloween but also sporadic flooding in Portland, and it still beat the guarantee by more than 30%. A good time was had by all, especially the Poker Mutant. All images via Encore Poker Club Facebook page. Oregon’s Justin “Red” Phillips was a 2:1 favorite over the Poker Brat in Poker Update’s “Most Memorable Televised Poker Hand of All Time” contest, with a couple hundred votes cast as of yesterday night. 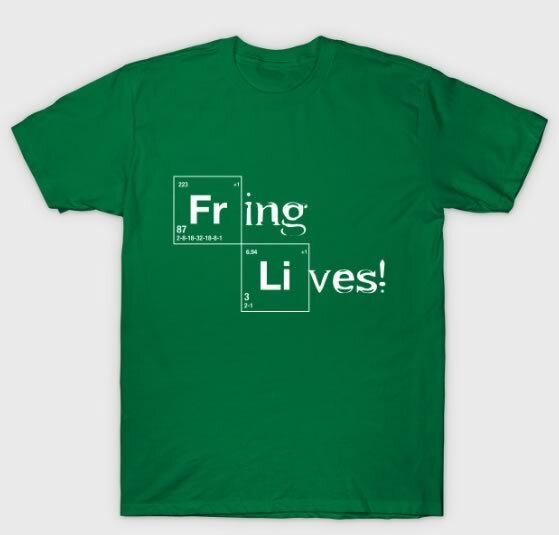 I just checked, voting’s over, and Red’s the winner! It’s largely due to you folks, and I feel almost like I sucked out on Phil Hellmuth myself. Just a reminder that Sunday is the start of the World Series of Poker November Nine broadcast. Yeah, it was the Deal a month-and-a-half ago, and I usually try to pick something a little further in the future than tomorrow, but the thing about Wildhorse is that it’s the biggest series close enough to Portland that you can leave after breakfast and get there in time for the noon tournament. Everyone in town knows about it, so I’m just going to provide some numbers for everything but the satellites, based on what was reported to Hendon Mob for last year’s Fall Round Up. 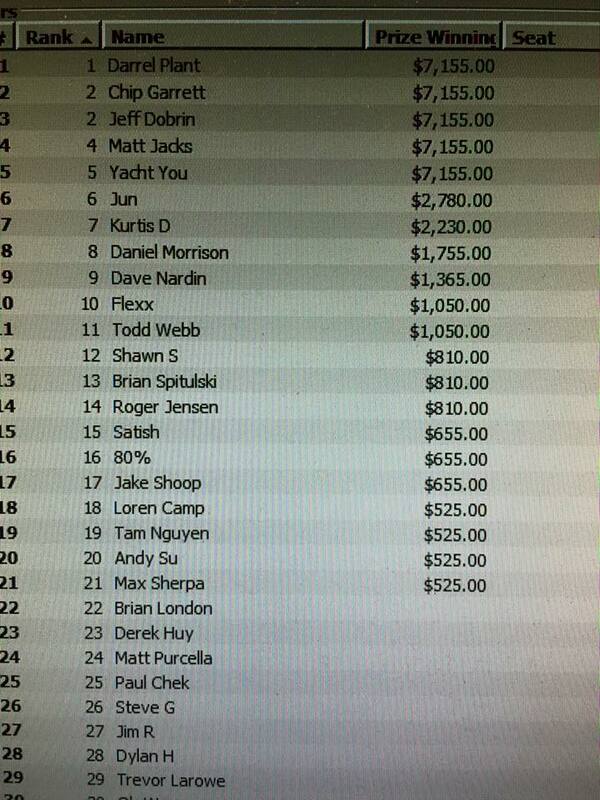 The Median Cash/ROI column shows what you get if you make it through half of the players who get paid. 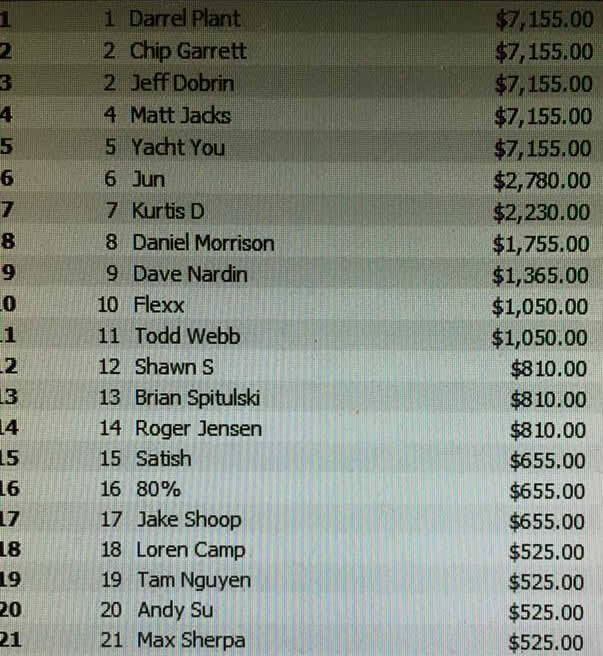 For example, if 25 players get paid and you cash for 13th, there are 12 players who make more and 12 who make less (the median for 24 cashing players is the average of payouts for 12th and 13th). 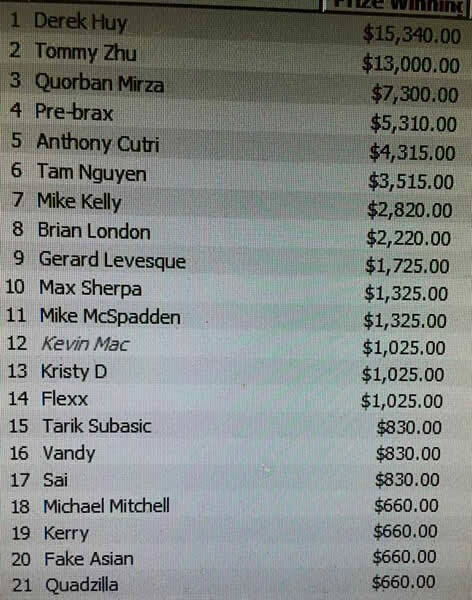 As you can see, the profit for the median cash varies widely, with the best bets for your money being the final $100 event, where the money added to the prize pool has an outsized effect. This year’s schedule is essentially the same, with the big difference being that the High Roller has been moved to Thursday. Two years ago when it was first offered, it conflicted with HORSE, which is a game that the kind of people who can afford a $1.5K buyin in a tournament are also drawn to. Last fall and this spring, it was up against the Seniors event—again where some of the deep money resides. Hopefully, this change will let the game grow a bit. Personally, I think it’s right in the sweet spot. In addition to the regular tournament, there are super satellites for the Main Event tomorrow (11/5) and the evening of the Seniors tournament (Wednesday), super satellites for the High Roller in the evening this Sunday and Monday (11/8 & 9), single-table satellites for everything running in the mornings, and lots of cash games. The regular rooms at the Wildhorse complex are mostly sold out for the week, but you can still find rooms in Pendleton itself without having to rent a tower suite, and the Wildhorse shuttle bus operates once an hour, on call (800-654-9453 x2), until 3am if you’re traveling in a group and not everyone has keys to the car. 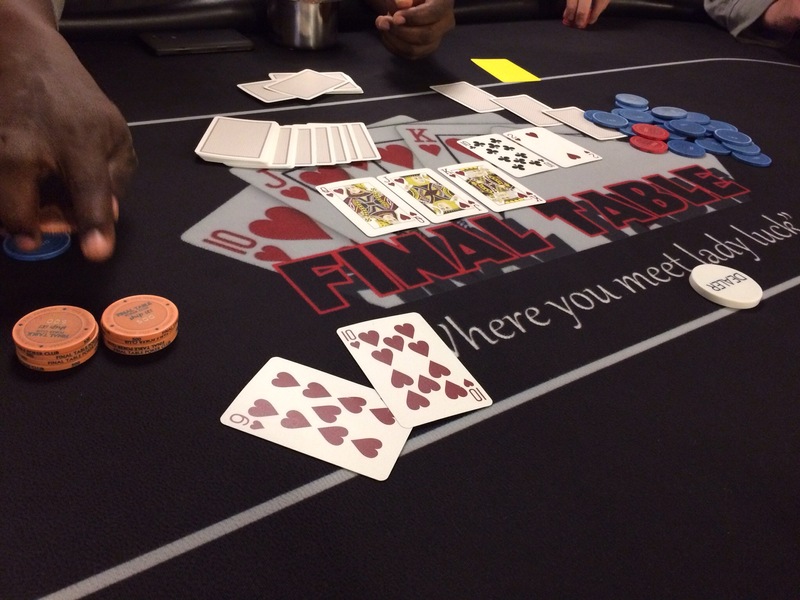 It’s the first week of the month, and that means the First Friday $20K guarantee at Final Table is on. Still one of the best values of a $100 buyin tournament you can find. I was discussing with a friend on Monday whether it would be going, what with people heading out to Pendleton, but Angela posted a notice for the game to the NW Poker Facebook group as we were talking about it. Friday night, Portland Players Club has a $1.5K guarantee Big O tournament at 7:15pm. $40 buyin/rebuy and $20 addon. 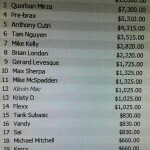 The Wildhorse Fall Poker Round Up starts tomorrow, see above. LA’s Hustler Casino Liz Flynt Fall Poker Classic puts a happy ending on their series today and tomorrow. CardPlayer‘s tournament calendar lists another $250K guarantee event there at the end of November, but there’s no mention of it on the casino’s web site. The Venetian Deepstacks Extravaganza IV runs until Thanksgiving. This weekend’s big event is a $1.1K buyin $200K guarantee. Next week is another $200K guarantee, but with a $600 buyin. Lots of Oregon folks are down at Harveys Lake Tahoe for the World Series of Poker Circuit event. 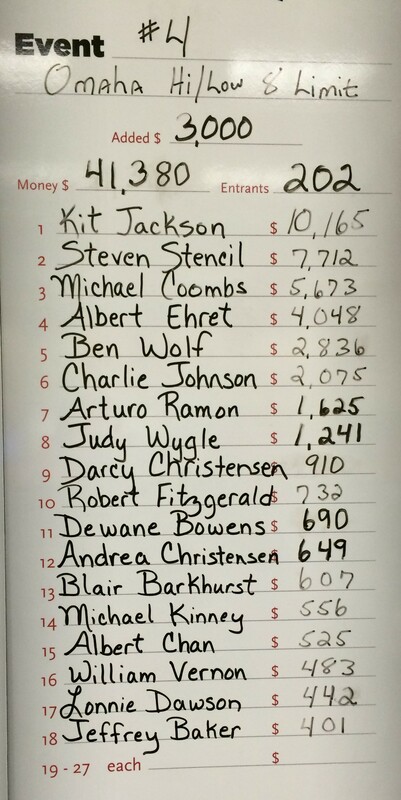 The $1,675 Main Event begins Friday. 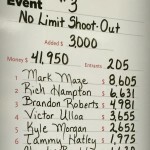 Tom Ottman of Battleground, WA got close to a ring in Event #4 on Monday. The Mid-States Poker Tour stop at Golden Gates, west of Denver starts tomorrow. The Main Event has a $1.1K buyin and $200K guarantee. I almost missed the LA Poker Open at Commerce Casino in LA! Starts Friday and runs through Sunday the 22nd. The Main Event is a $500K guarantee with a $1,650 buyin, but there are a dozen or so other events including HORSE, PLO, and PLO8. Aria in Las Vegas has a couple more of those $25K High Rollers on November 6th and 7th to take advantage of the folks in town railing the WSOP Main Event. Friday the 6th is the opening of the World Tavern Poker Open at Planet Hollywood (which I wrote about last month); it ends just before the World Series of Poker Circuit hits the same venue. The WSOPC lands on Planet Hollywood in Las Vegas next week, planting its flag with a $580 opening event that has six starting flights over three days and a $500K guarantee. A little closer, WPTDeepstacks is visiting Redding, California’s Win-River Casino between the 13th and 23rd, featuring a $150K guarantee Main Event with a $1.1K buyin. 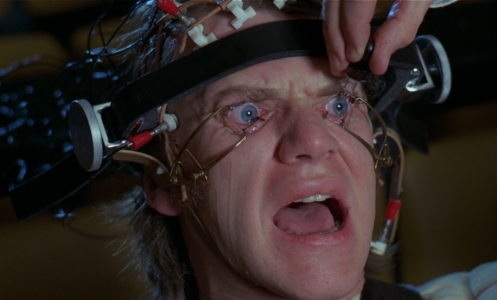 I’ll be honest with you my droogies, it has not been the most comfortable of years here at Poker Mutant Central. I got into poker in part because I didn’t have much else going on, in terms of work, and a good part of the reason I’ve spent a lot of time on analysis of stats was tying to determine whether my trends were up or down, because the margins I work on are pretty thin. I spent part of the middle of the year trying some new ranges and tactics, in order to counteract a perception I had that I was getting to, or close to, the money with too short of a stack to make it deep. Because it takes a while for actual trends to overcome short-term variance in live play, that led to a few really unpleasant months before I could determine for sure that the improvements were a worse option than what I was trying to improve on. Coupled with some non-poker life events that impacted my already meagre bankroll, and despite the surge in notoriety I’d gotten from the summer series roundups, my appearances with Limon, and the weekly tournament info I’ve been publishing, I’d decided that the two events at the EPS that I was able to play were going to determine whether I could continue with poker. I’d had a decent fifth-place cash in a $9K at Encore on Columbus Day, but I was going to have to cover property taxes in November…well, you folks don’t want to hear about that kind of real-life crap. Let’s talk about poker and what went right. Thursday night was the first of the EPS events, a $20K guarantee with a $100 buyin, one rebuy, and a $50 addon. The info on the event didn’t specifically say it was a live rebuy—which I kind of hate—but it was, and there were 110 rebuys in the event, which doubled its guarantee. I didn’t make it that far, busting after two-and-a-half hours with AxKx and top pair on the river after bluffing into a turned set of 8s. Friday night in Event #2, I sat down with this summer’s Golden One, Micah Bell, on my right. I picked up a few chips playing T♣6♣ from the button and hitting trips, and managed to work my way up to 24K from the 15K starting stack by the break. Then, the first hand after the break, I l;et myself lose the 10K I’d bought with the addon chasing a flush on a paired board with a suited ace, hitting the ace on the turn and paying off a 3K value bet on the river to 8♠5♠ in the big blind, who’d called my early position pre-flop raise along with three others and flopped trip 8s. I slid down below the starting stack on the next couple of hands as I payed the blinds, had decent defense cards, then folded after the flop, but doubled up to just about what I’d bought in chips ten minutes later (that’s the little bobble you see in the graph above on either side of the first white vertical bar that indicates a break). By the end of level 6 (last chance for entry), I’d crept back above the 25K in chips I’d bought (15K start, 10K addon), but was well behind the chip average. Things started moving in the third session. I had less than 20BB in level 8 when I picked up a pot that got me over 40K, then I shoved another suited ace on the flop against a set not long before the third break to push me up near 100K. By then, half the field of 190 was gone, and I was over the chip average for the first time in the game. 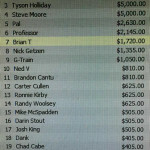 A three-bet with KxKx over an opening raise from Micah put me above 100K as we went into the break. Our table broke in level 11, and on the last hand before that I picked up QxQx and shoved as part of the closing action over two all-in short stacks, knocking both of them out and moving up to 125K. Winning a couple of races pushed me to 250K in just 15 minutes at the new table. The capable Max Young shoved 90K with AxQx and ran into my TxTx. A few more chips before break 4 and I was at 355K. The chip average with 38 of 190 players remaining was 155K. 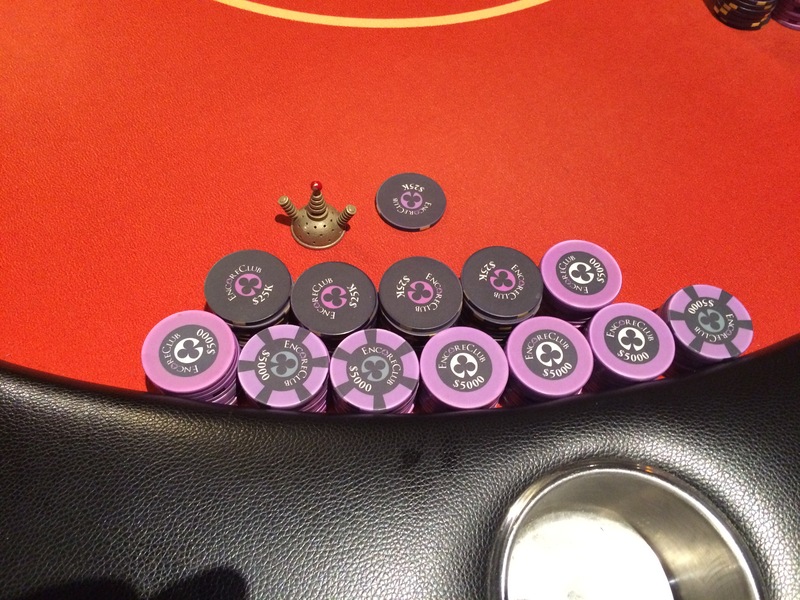 Including rebuys and addons, there were about 5.9M chips in play. The 8K, 10K, and 12K big blind levels were similarly fruitful, as I doubled my stack again in 75 minutes. We hit the money at 21 places before the next break. Before the level after break was over, I passed 800K and we were down to two tables. Then I picked up AxAx in the BB and caught an AxQx all-in from an under-average stack. That bumped me over 1.3M chips and cut the number of players to 15. The stack took a bit of a hit when I doubled up AxAx with AxKx, but I was still over a million. We finally hit the final table after nine hours and fifteen minutes, and while some other players had caught up a bit, I still had the chip lead. I played a bit tight because we had some good people at the final, like WSOPC ring-winner Jeff Dobrin, who was pounding away on my immediate right. So I eventually slipped below a couple of the other stacks until I shipped a hand over one of his raises that put me back into the lead. I’d first proposed a chop back when were seven-handed or so, where the chop wouldn’t have triggered any time-consuming tax paperwork (it’s all the same to me, I pay my taxes, but it does get you paid off faster). There were a couple of objections, then again when ICM numbers were run for five players. As we headed into the 100K big blind level, however, it became apparent to everyone that the chip leader (me) had all of 14BB, and everyone else had less, so with a disparity of $3.4K for fifth and $13.7K for first, we were all flipping for between $800 and $10K with every hand we played. Even chop agreed to. So the Mutant still roams the wilds of the poker rooms in Portland and beyond, for a little longer. He left $600 for the dealers, because he wants poker to continue in Portland, and volunteer dealers have to eat, but he’s got property taxes of his own. He expects he’ll see some of you in Pendleton next week. Ten hours and twenty minutes. 3080% ROI.